The second in a trio of undead modules is a major favorite of mine. It stages an eternal moment for the damned who yearn for eschatological liberation, and crave a sympathy impossible to give. The Paths of the Dead have to be the most terrifying place in Middle-Earth seen by any members of the Fellowship of the Ring, and almost as lethal as the Barrow-Downs. I prefer MERP's classification of the undead over TSR's, and this product outlines the hierarchy: ghouls at the bottom, dumb corpses able to inflict disease but not drain energy; skeletons next, much more fearsome than the TSR breed, able to energy-drain, and cause fear and stun; then ghosts, devoid of physical bodies but intelligent and able to drain energy, sometimes even unconsciously; and finally, wraiths or wights, the worst energy-drainers, often spell-users, and able to mesmerize or dominate their prey by force of will. All of these can be found in the paths, especially ghosts -- but that's not all. There are also the weird pukel-creatures that lie dormant and animate in the presence of the living: stone men, rock lizards, granite spiders, stalactite birds, and even "living lightning". This horror show is the product of oath-breaking, an act which carries devastating consequences in Tolkien's world, as bad as a high-level D&D curse. The treachery dates to the end of the Second Age, when Gondor's primitives (the Daen Coentis) refused to honor the Dunedain and march against Sauron, and the effects were instant: ore veins dried up, livestock died, harvests shrunk, artisans forgot their skills, and women became barren. People who died suddenly walked the tombs of the primitive nobles, tormented by local confinement. The paths thus sweat a despair that feels intrinsic to the place, something self-inflicted, unlike the invaded Barrow-Downs. They are mapped over a 20-mile stretch under the Dwimorberg mountain, and given 11 major areas, with anywhere from 1-7 rooms per area. The rooms are filled with tombs and cursed chambers, and the City of Sorrow in the middle, with all manner of undead and pukel-creatures around every corner. It's hard not to envision the huge cavern of the City of Sorrow as Peter Jackson gave it to us, though ICE has the undead actually avoiding this place in favor of smaller areas -- the Tombs of the Oathbreakers (populated by the nastiest and oldest of the undead), the Tombs of the Glorious (the resting place of those who died during the Golden Age of the Daen Coentis culture in the mid-Second Age), and the Tombs of the Heirs (the fathers of the oath-breakers). There are more than enough treasures and enchanted items to make attempting the paths worthwhile for PCs, if they can survive. 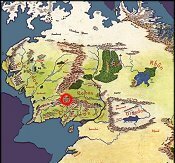 The second major layout is the fortress of Morthondost built by Gondor between 570-714, which looks over the town of Sarn Erech. There are colorful politics here (geared for the 1640 period) revolving around an incompetent prince who keeps his sister (the true heir to Morthond) imprisoned like a rat, while the fief is ruled by his despotic master-at-arms. Sarn Erech itself is given remarkably thorough detail; the map key even supplies two 1-4 star ratings for every tavern, inn, shop, and professional establishment -- one for quality, the other for price. Finally, there is the ancient site of the hill with the black stone, on which the Daen Coentis swore allegiance to Gondor and would renew that vow at Aragorn's coming. Some might complain that the Morthondost scenario is space filler, but I disagree. The physical torment eating away a Gondorian princess is a microcosm of the spiritual one consuming the vale, and it all integrates perfectly. 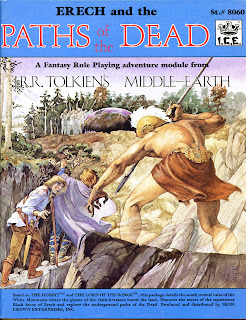 If I could run only one adventure-sized module before joining the dead myself, I might very well choose Erech and the Paths of the Dead. 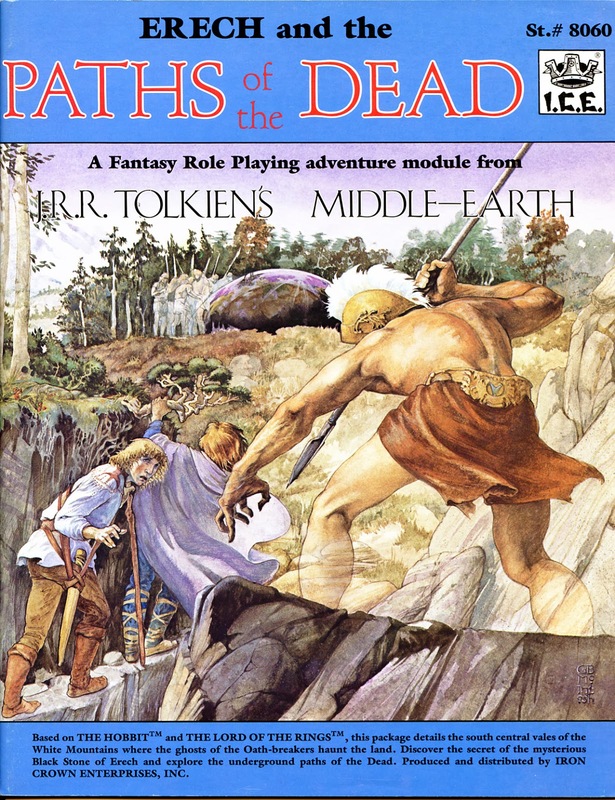 Having run the adventure at Morthondost on a number of occassions (using several different rules systems, including ICE's ME, 2nd AD&D & Runquest) I can attest that it's a crowd pleaser. In my favorite run, one of the PC's was the youngest brother of the noble living in Morthondost (as per the adventure, he was away squiring at the time of his father, mother and sister's death). He didn't like the way his brother 's thugs ran rufshod over the village, and although prepared to take up the mantle of leadership himself, was overjoyed to find his siter alive and held captive. The final scene in that particular adventure was grand. After killing the leader of the evil men-at-arms and freeing his sister, he claimed the fief's royal sword and executed royal justice (which he had the right to do) upon his brother. He then crowned his siter and road off into the sunset. What heroics. Sounds like a great session, Jay. I find the whole castle-village setting incredibly inspired. Thanks for sharing.